Grease Removal Services: SMC Grease Specialist provides scheduled pick up service for used kitchen oil (yellow grease) for over 5,000 customers in our Tri-State service are of California, Arizona and Nevada.SMC Grease Specialis will provide your location with a grease collection container at no charge. The container provided meets or exceeds all state and local requirements for such grease collection products. In response to the ever increasing problem of GREASE THEFT, SMC Grease Specialist is now providing the original indoor grease storage solution, the ENVIROTUB.. 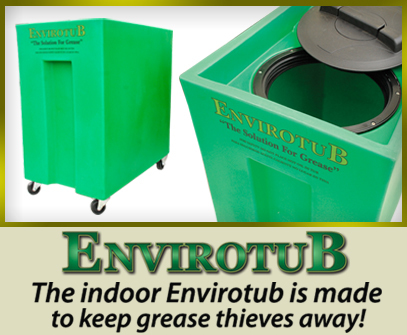 The ENVIROTUB was specifically designed to help grease pumper companies and their participating restaurants to help deter the crime of grease theft and make for a safer work environment.